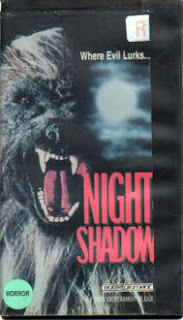 When I first saw ‘Night Shadow’ come up on the screen, I couldn’t remember how or why I had bothered to find it, much less spend an hour and a half watching it. The title makes it sound like a slasher movie or maybe something with ghosts, or perhaps even slasher ghosts. Over the title itself there is the sound of snarling and growing, so maybe it was some kind of monster movie or even better a killer bear movie? Then I saw Aldo Ray and Kato Kaelin’s names appear in the credits and I knew exactly why I had gone looking for this particular movie. Night Shadow has a lot of elements that could have made it a minor trash classic, there’s a lot of humor both intentional and not so intentional. It has a martial arts brawl in the middle for no real reason. Everything feels off kilter and awkward, and it would have been a lot of fun it didn’t take so long to get to the core of the story. It’s a solid hour into the movie before the cops even know there’s a killer on the loose. In the meantime were stuck watching Kato trying to make out with some girl, or Aldo Ray wiggle a flashlight that looks like a fish at the camera. Even when there is some werewolf action, it’s mostly off screen and virtually bloodless. Very disappointing. The werewolf costume is passable but for some reason strangely shaggy. It’s a shame you don’t get to see it do more werewolf stuff, for instance he kills someone with a lead pipe, what an unsatisfying unwerewolf way to kill a person. Normally I’m pretty forgiving when it comes to plot inconsistencies but later in the film when it’s revealed the werewolf wants Brenda for his mate and that he’s been trailing her from LA, how did get ahead of her when his car broke down? What makes Brenda werewolf mate material? Why does the deputy act like such a jerk and then turn around at the last minute and start acting all heroic? None of these things are addressed, and you are strung along hoping the werewolf eats a few more of these people. And the bad gets a whole lot badder.